This article is about the town of Omagh. For the film of same name, see Omagh (film). Omagh (/ˈoʊmə/ or /ˈoʊmɑː/; from Irish: An Ómaigh, meaning "the virgin plain" [ənˠ ˈoːmˠəi]) is the county town of County Tyrone, Northern Ireland. It is situated where the rivers Drumragh and Camowen meet to form the Strule. Northern Ireland's capital city Belfast is 68 miles (109.5 km) to the east of Omagh, and Derry is 34 miles (55 km) to the north. 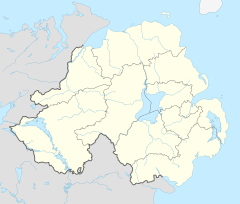 The town has a population of 21,297, and the former district council, which was the largest in County Tyrone, had a population of 51,356 at the 2011 Census. Omagh contains the headquarters of the Western Education and Library Board, and also houses offices for the Department of Agriculture and Rural Development at Sperrin House, the Department for Regional Development and the Northern Ireland Roads Service at the Tyrone County Hall and the Northern Ireland Land & Property Services at Boaz House. The name Omagh is an anglicisation of the Irish name an Óghmaigh (modern Irish an Ómaigh), meaning "the virgin plain". A monastery was apparently established on the site of the town about 792, and a Franciscan friary was founded in 1464. Omagh was founded as a town in 1610. It served as a refuge for fugitives from the east of County Tyrone during the 1641 Rebellion. In 1689, James II arrived at Omagh, en route to Derry. Supporters of William III, Prince of Orange, later burned the town. In 1768 Omagh replaced Dungannon as the county town of County Tyrone. Omagh acquired railway links to Londonderry with the Londonderry and Enniskillen Railway in 1852, Enniskillen in 1853 and Belfast in 1861. St Lucia Barracks were completed in 1881. In 1899 Tyrone County Hospital was opened. The Government of Northern Ireland made the Great Northern Railway Board close the Omagh – Enniskillen railway line in 1957. In accordance with the Benson Report submitted to the Northern Ireland Government in 1963, the Ulster Transport Authority closed the Portadown – Omagh – Londonderry main line in 1965, leaving Tyrone with no rail service. St Lucia Barracks closed on 1 August 2007. On 30 December 1942 a Consolidated Catalina Ib of No. 240 Squadron RAF which was operating from RAF Killadeas crashed into the town. The crash killed all eleven occupants, however no one on the ground was killed or injured. The cause of the crash was never ascertained. 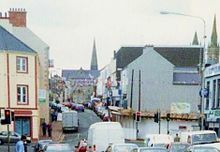 Omagh came into the international focus of the media on 15 August 1998, when the Real Irish Republican Army exploded a car bomb in the town centre. 29 people were killed in the blast – 14 women (including one pregnant with twins), 9 children and 6 men. Hundreds more were injured as a result of the blast. In April 2011, a car bomb killed police constable Ronan Kerr. A group of former Provisional IRA members calling itself the Irish Republican Army made its first public statement later that month claiming responsibility for the killing. Omagh as seen from the Strule bridge. In the background is the Sacred Heart Catholic church. These wards are only those that cover the town. St. Columba's Church of Ireland in Omagh. Snow is common in Omagh during the winter months. Shown here is the River Strule. One of the major floods of 1969, shown here on Drumragh Avenue. An air temperature of −19.4 °C (−2.9 °F) was recorded once, and it remains the coldest air temperature ever recorded in Ireland. [better source needed] Omagh has a history of flooding and suffered major floods in 1909, 1929, 1954, 1969, 1987, 1999 and, most recently, 12 June 2007. As a result of this, flood-walls were built to keep the water in the channel (River Strule) and to prevent it from overflowing into the flood plain. Large areas of land, mainly around the meanders, are unsuitable for development and were developed into large, green open areas, walking routes and parks. The Köppen Climate Classification subtype for this climate is "Cfb" (Marine West Coast Climate/Oceanic climate). Omagh is classified as a large town settlement by the Northern Ireland Statistics and Research Agency (NISRA). 13.92% had some knowledge of Irish (Gaelic) and 4.30% had some knowledge of Ulster-Scots. Glenpark Road. Heading south-west towards Omagh; to the left is the "Rest and be thankful" bench. The Ulster American Folk Park near Omagh includes the cottage where Thomas Mellon was born in 1813, before emigrating to Pennsylvania, in the United States when he was five. His son Andrew W. Mellon became secretary of the US Treasury. The park is an open-air museum that explores the journey made by the Irish (specifically those from Ulster) to America during the 1800s. The park is used to host events during Easter, Christmas, Fourth of July and Halloween. It also hosts a major Bluegrass festival every year. Over 127,000 people visited the park in 2003. The Gortin Glens Forest Park, 16 kilometres (9.9 mi) north of Omagh is a large forest with a deer enclosure and several waterfalls and lakes. Strule Arts Centre opened in 2007 is an example of urban renewal in Omagh town centre. Creating a modern civic building, in a newly created public space reclaimed from the formerly disused area, between the River Strule and High Street. Omagh has over 20 playgrounds for children, and a large amount of green open area for all the public. The largest of these is the Grange Park, located near the town centre. Many areas around the meanders of the River Strule have also been developed into open areas. Omagh Leisure Complex is a large public amenity, near the Grange Park and is set in 11 hectares (27 acres) of landscaped grounds and features a leisure centre, boating pond, astroturf pitch and cycle paths. Omagh is the main retail centre for Tyrone, as well as the West of Ulster (behind Derry and Letterkenny), due to its central location. In the period 2000–2003, over £80 million was invested in Omagh, and 60,960 m2 (656,200 sq ft) of new retail space was created. Shopping areas in Omagh include the Main Street, Great Northern Road Retail Park and the Showgrounds Retail Park on Sedan Avenue in the town centre. Market Street/High Street is also a prominent shopping street, which includes high street stores such as DV8 and Primark. The 'Omagh Accessible Shared Inclusive Space' (OASIS), a £4.5 million facelift for Omagh's riverbank, was funded by the European Union and planning approved in 2013. The development included the construction of a pedestrian bridge linking Drumragh Avenue and Old Market Place, a riverside walk, exercise areas, electronic information hub, artwork panels, games tables and fishing stands. The plans also included a covered performance and stage area and a neutral civic space able to accommodate markets, concerts and general recreational activities partially occupying lands at Drumragh Avenue car park. Construction for the project began in March 2014, and the OASIS plaza was officially opened in June 2015. Looking at the town's Bridge Street area from an elevated height at the College. Neither the town nor the district of Omagh has any railway service. The Irish gauge 1,600 mm (5 ft 3 in) Londonderry and Enniskillen Railway (L&ER) opened as far as Omagh on 3 September 1852 and was extended to Enniskillen in 1854. The Portadown, Dungannon and Omagh Junction Railway (PD&O) reached Omagh in 1861, completing the Portadown – Derry route that came to be informally called "The Derry Road". The Great Northern Railway (Ireland) absorbed the PD&O in 1876 and the L&ER in 1883. The Government of Northern Ireland made the GNR Board close the Omagh – Enniskillen line in 1957. The Ulster Transport Authority took over the GNR's remaining lines in Northern Ireland in 1958. In accordance with The Benson Report submitted to the Northern Ireland Government in 1963, the UTA closed the "Derry Road" through Omagh on 15 February 1965. Later the Omagh Throughpass road was built on the disused trackbed though Omagh railway station. Ulsterbus in 2007 in Omagh Ulsterbus station. A proposal to reopen the line between Portadown and Omagh was considered by the NI Department for Regional Development in their Future Railway Investment: A Consultation Paper in early 2013. The proposal is not ranked as a high priority in the report for railway investment from 2015 to 2035. The report estimates that a link from Portadown to Omagh would cost around £475 million, thought it admits that no detailed feasibility study has been carried out. There are plans to reopen railway lines in Northern Ireland including the line from Portadown via Dungannon to Omagh. The Omagh Throughpass (Stage 3) opened on 18 August 2006. Omagh has a number of educational institutions at different levels. Omagh is also the headquarters of the Western Education and Library Board (WELB), which is located in Campsie House on the Hospital Road. Three Churches in view: Church Street Methodist, Sacred Heart RC, and St Columba's Church of Ireland. Trinity Presbyterian Church, behind the Three Church view. Local newspapers and magazines include Omagh Today, the Tyrone Advertiser, Tyrone Constitution, Tyrone Herald, and Ulster Herald. Radio station Q101.2 FM West broadcasts from Omagh. BBC Radio Ulster also had a studio in the town. A community radio project, Strule FM, broadcast for four weeks in December 2008, and received a Bronze award for Community Radio at the 2009 Sony Radio Academy Awards. Omagh was one of the first areas in Northern Ireland, outside the Belfast commuter belt, to transfer to broadband internet. Prior to this, the only means for internet connection was through dial-up connections. In 2014, Omagh became one of only seven Northern Irish towns to receive superfast 4G mobile data coverage from the EE network. Gaelic games, primarily Gaelic football, are the most popular sports in Omagh. The town has two Gaelic football clubs, Omagh St. Enda's, which plays its home games in Healy Park, and Drumragh Sarsfields, which plays its home games at Clanabogan. Healy Park is the home of Tyrone GAA and the county's largest and main sports stadium located on the Gortin Road, has a capacity nearing 25,000, and had the distinction of being the first Gaelic-games stadium in Ulster to have floodlights. The stadium now hosts the latter matches of the Tyrone Senior Football Championship, as well as Tyrone's home games, and other inter-county matches that require a neutral venue. Omagh no longer has a top-flight local football team, since the demise of Omagh Town F.C. in 2005.Strathroy Harps FC who are the only Omagh and Tyrone team to win the Irish junior cup twice in 2012 and 2013. Omagh's rugby team, Omagh Academicals (nicknamed the "Accies"), is an amateur team, made up of primarily of local players. Omagh Cavaliers Cricket Club located in Omagh. Brian Friel (1929 - 2015) – playwright was born in Killyclogher near Omagh. Arty McGlynn – International renowned guitarist. Gerald Grosvenor (1951-2016) – 6th Duke of Westminster. Pat Sharkey (b. 1953) – Ipswich Town F.C. and Northern Irish football player in the 1970s. Ivan Sproule (b. 1981) – current Northern Irish football international and Bristol City F.C. player. Joe McMahon (b. 1983) – All-Ireland-winning Tyrone Gaelic footballer. Justin McMahon – All-Ireland-winning Tyrone Gaelic footballer. ^ "2006 annual report in Ulster-Scots – North/South Ministerial Council" (PDF). Northsouthministerialcouncil.org. Archived from the original (PDF) on 27 February 2013. Retrieved 20 October 2016. ^ "Guide to Beaghmore stone circles – Ulster-Scots" (PDF). Department of the Environment. Retrieved 20 October 2016. ^ "An Ómaigh/Omagh". Logainm.ie. Retrieved 20 October 2016. ^ Gwynn, Aubrey; R. Neville Hadcock (1970). Medieval Religious Houses Ireland. Longman. pp. 267, 273, 400. ISBN 0-582-11229-X. ^ a b Baker, Michael H.C. (1972). Irish Railways since 1916. London: Ian Allan. pp. 153, 207. ISBN 0 7110 0282 7. ^ "Omagh gets green police station". Ulster TV. 14 September 2010. Retrieved 12 October 2014. ^ Ranter, Harro. "ASN Aircraft accident Consolidated Catalina Ib (PBY-5B) FP239 Omagh, Reaghan, Northern Ireland". aviation-safety.net. ^ Suzanne Breen (22 April 2011). "Former Provos claim Kerr murder and vow more attacks". Belfast Telegraph. Retrieved 26 April 2011. ^ "Northern Ireland Placenames Project". Placenamesni.org. Retrieved 28 June 2010. ^ "Northern Ireland Placenames Project – Coolnagard". Placenamesni.org. Retrieved 28 June 2010. ^ "Northern Ireland Placenames Project – Culmore". Placenamesni.org. Retrieved 28 June 2010. ^ "Northern Ireland Placenames Project – Dergmoney". Placenamesni.org. Retrieved 28 June 2010. ^ "Northern Ireland Placenames Project – Gortmore". Placenamesni.org. Retrieved 28 June 2010. ^ "Northern Ireland Placenames Project – Killybrack". Placenamesni.org. Retrieved 28 June 2010. ^ "Northern Ireland Placenames Project – Killyclogher". Placenamesni.org. Retrieved 28 June 2010. ^ "Northern Ireland Placenames Project – Lammy". Placenamesni.org. Retrieved 28 June 2010. ^ "Northern Ireland Placenames Project – Lisanelly". Placenamesni.org. Retrieved 28 June 2010. ^ "Northern Ireland Placenames Project – Lisnamallard". Placenamesni.org. Retrieved 28 June 2010. ^ "Northern Ireland Placenames Project – Lissan". Placenamesni.org. Retrieved 28 June 2010. ^ "Northern Ireland Placenames Project – Mullaghmore". Placenamesni.org. Retrieved 28 June 2010. ^ "Northern Ireland Placenames Project – Sadennan". Placenamesni.org. Retrieved 28 June 2010. ^ "Northern Ireland Placenames Project – Straughroy". Placenamesni.org. Retrieved 28 June 2010. ^ "FOREST MANAGEMENT IN THE IRISH CLIMATE CONTD..." Piffs.com. Retrieved 20 October 2016. ^ "Travel Weather Averages (Weatherbase)". Weatherbase.com. Retrieved 20 October 2016. ^ "Weatherbase.com". Weatherbase. 2013. Retrieved on 12 July 2013. ^ "Northern Ireland Statistics and Research Agency". NISRA.gov.uk. 27 September 2010. Retrieved 20 October 2016. ^ "Census 2011 Population Statistics for Coleraine Settlement". Northern Ireland Statistics and Research Agency (NISRA). 2011. Retrieved 5 June 2018. ^ "Wayback Machine". 11 March 2007. Archived from the original on 11 March 2007. ^ "National Museums Northern Ireland - Welcome". Folkpark.com. Archived from the original on 4 July 2009. Retrieved 20 October 2016. ^ "Omagh District : Quality Of Life : Healthy District : Childrens Play Area : Omagh County Town of Tyrone Northern Ireland at the Foothills of the Sperrins". 26 July 2003. Archived from the original on 26 July 2003. ^ "Omagh's riverbank area to get £4.5 million facelift". ulsterherald.com. Ulster Herald. 4 April 2013. Retrieved 20 October 2016. ^ "Omagh's £4.5m OASIS project is ready to rock". ulsterherald.com. Ulster Herald. 21 June 2015. Retrieved 30 January 2019. ^ a b "Omagh station" (PDF). Railscot – Irish Railways. Retrieved 22 November 2007. ^ a b Hajducki, S. Maxwell (1974). A Railway Atlas of Ireland. Newton Abbott: David & Charles. map 7. ISBN 0-7153-5167-2. ^ FitzGerald, J.D. (1995). The Derry Road. Colourpoint Transport. Gortrush: Colourpoint Press. ISBN 1-898392-09-9. ^ "New lines proposed in Northern Ireland rail plan". Railjournal.com. 3 May 2014. ^ "Lisanelly: Work begins to create shared campus in Omagh". BBC. 23 October 2013. ^ "95% Geographic 4G Coverage | 4G Network". Ee.co.uk. 26 May 2016. Retrieved 20 October 2016. ^ "World Stadiums". Retrieved 7 March 2011. ^ "Healy Park, Omagh". Ulster Colleges GAA. Archived from the original on 28 July 2011. Retrieved 7 March 2011. ^ "Healy Park set to unveil lights". BBC News. 6 April 2006. Retrieved 7 March 2011. ^ "Benedict Kiely". 12 June 2002. Archived from the original on 12 June 2002. Wikimedia Commons has media related to Omagh. Wikivoyage has a travel guide for Omagh. "Omagh" . Encyclopædia Britannica (11th ed.). 1911.